Did you know that rapid brain development happens at an early age? By age 6, your child’s brain is already 90% developed! As moms, what can we do to ensure our kids get what they need in this crucial stage? The school year is almost half-way through. Time flies, indeed! Realizing that, it’s very important to take every chance to help our children not just with their studies, but also with their overall health and development. Growth must be holistic. I have seen significant improvement with my kids’ mental and social skills since they started taking the NEW #ScottsDHAGummies. In my previous post, I have shared with you its importance. Now, this is the “how” part. There are different ways or approach to support our children’s brain development. It is essential that we do this as early as possible. My sons love adventure and creating new experiences like me. I’m so lucky I have such fun-loving and super “malambing” boys! I feel like I’m the spoiled mom sometimes. Haha! To be able to help them, you must really know them. Know what their likes and dislikes are. Focus on their interests because those will be their strengths. At the same time, you should identify their weaknesses and work on them together. The key is to make them enjoy their journey to being well-rounded. After all, they are kids and they’re supposed to be happy and having fun. My kids are very imaginative and exciting, so I found it as an opportunity for me to help them discover their creative side and cultivate it by doing cool and productive activities together while having #ScottsDHAGummies. There’s this great idea I came across while browsing the internet. 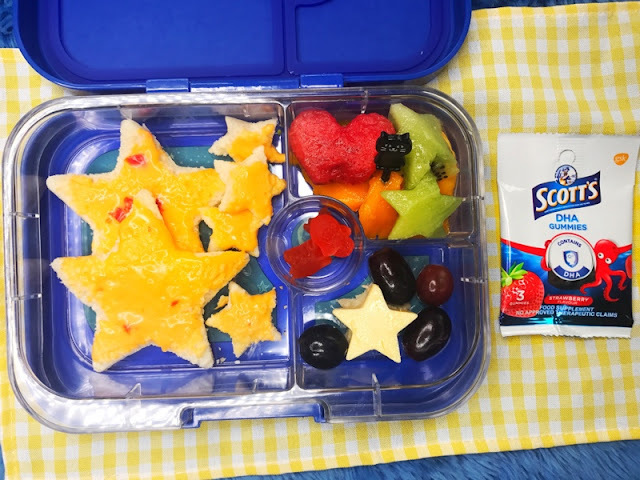 DIY Lunchable! I decided to let them help me in organizing their “baon” for school. First, I showed them how to do it in a creative and healthy way. I cut some fruits and bread in different shapes. I made sure my creation is colorful to make it more enticing to eat. Here it is! Then, I let them design their own lunchbox. This way their brain could already warm up in preparation for the day’s heavy exercise at school. I’m surprised with the result! They all exceeded my expectation considering it was their first time doing it. Of course, I made sure they include #ScottsDHAGummies for a complete and healthy diet. We’ll do this every day. I’m planning to let them prepare sandwiches and yummy side-dishes like carrots, broccoli and dips. There are other enjoyable activities that will let your kids practice and develop their creativity. Help them achieve their optimum brain development with #ScottsDHAGummies. Share your ideas and tips at the Comments section. More information on Scott’s DHA Gummies can be found at www.scottskids.com/ph. Scott’s DHA Gummies is available in Mercury Drug, Watson’s and leading supermarkets nationwide.